A slightly peppery taste with a fragrance reminiscent of orange and ginger. Turmeric is a great spice to experiment with. It can be used when baking bread, making sauces, stirring into drinks and can even be added to your favourite curries! 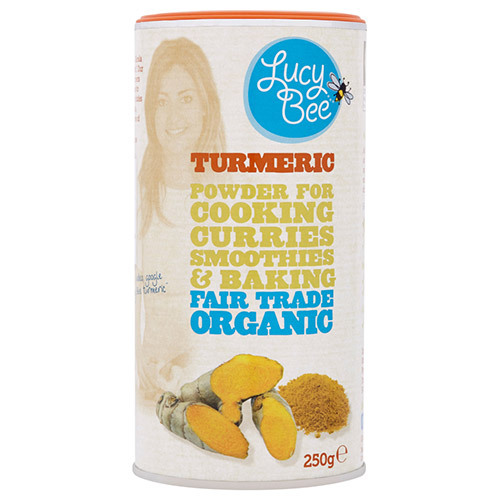 Lucy Bee`s organic turmeric is grown in the Kerala region, known as “India’s Spice Garden”. Their producer works with small artisan farmers throughout the whole growing process to make farming a viable option. Turmeric is often referred to as “Indian Saffron” and is part of the ginger family. It has been widely used for centuries in herbal remedies and contains the active ingredient curcumin, giving turmeric its vibrant colour. Great for cooking, baking, curries, drinks and smoothies. 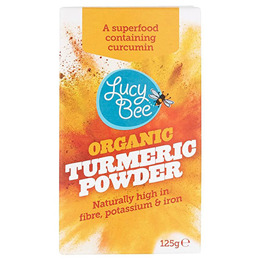 Below are reviews of Lucy Bee Organic Turmeric Powder - 250g by bodykind customers. If you have tried this product we'd love to hear what you think so please leave a review. This is my first time using Turmeric and it's fine. I have been using it in my smoothie. I cannot fault Lucy Bee's products. They are very tasty and natural. bodykind is a company that I trust. They have an excellent delivery service.